The Chinese Crested did not originate from China. It is thought they originated from Africa or Mexico and were brought to China aboard ships where the Chinese reduced them in size. Fortunately for the breed, they were brought aboard sailing ships to hunt vermin and were left as mementos throughout the world. The Chinese viewed the Crested as having magical healing powers and would use them as living heating pads. However, they were also the main ingredient in many a cooking pot. The first American breed club was established in 1979, and they have gained popularity ever since. 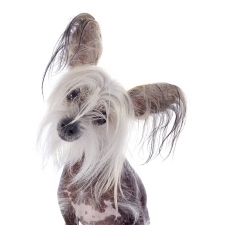 The Chinese Crested, both the hairless and the hairy, needs to be with their owner ALL the time. They adore and dote on their people and want to be with you wherever you go, sitting on your feet, sitting in your lap, and, yes, always sleeping with you. If they feel they’re not getting enough attention, they may backslide on housetraining, bark excessively, or develop obsessive tics such as spinning. However, they make an excellent companion as they are loving, cuddly, affectionate, and love to give kisses. They are lively, entertaining, happy, and playful. They do well with gentle children. They don’t make the best guard dog on the block, as they will sometimes bark at strangers and sometimes won’t. Chinese Cresteds, however, do howl, and can sometimes be trained to “sing” on command. They have minimal exercise needs, which can probably be met by playing in the house. They are intelligent and excel at agility and obedience training. These little dogs are truly people dogs and make a wonderful family pet as they view it their job to be your loving companion. Chinese Cresteds usually weigh up to 12 pounds and stand approximately 9 to 13 inches tall. They are a small dog with a very graceful and fragile build. One type of Chinese Crested, known as the powder puff, has a long, silky coat over a wooly undercoat. The other type is hairless except for their feet, the end of their tail, and the top of their head. Their skin color ranges from pink to black, mahogany, blue, lavender or copper, solid or spotted. This breed has two obvious problems – vulnerability to sunburn and excessive cold. However, keep in mind while shopping for sweaters for this little guy that they are allergic to wool. The teeth of the hairless version are often thin and misaligned, and some are actually missing. This is not a fault; it simply is genetic and goes along with the breed. The stripper Gypsy Rose Lee used to breed Chinese Crested dogs.